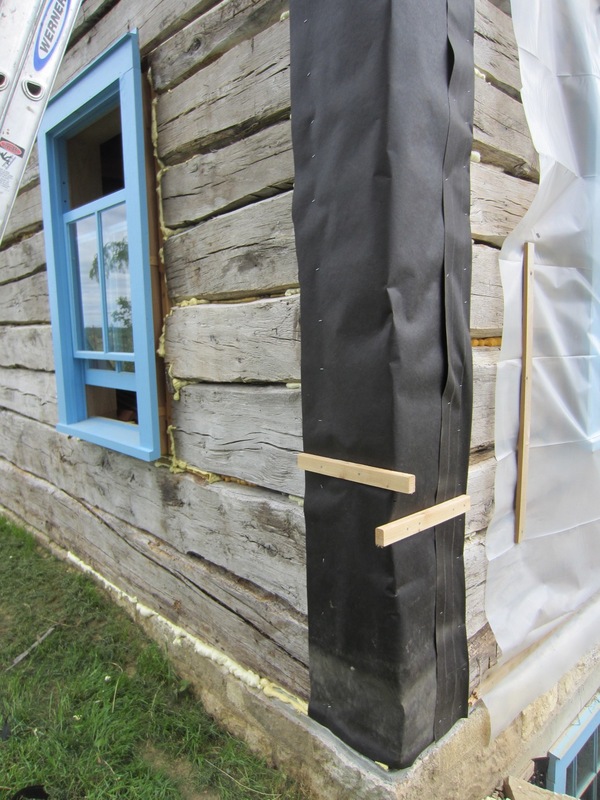 Siding a log building requires time, patience, and a lot of string. 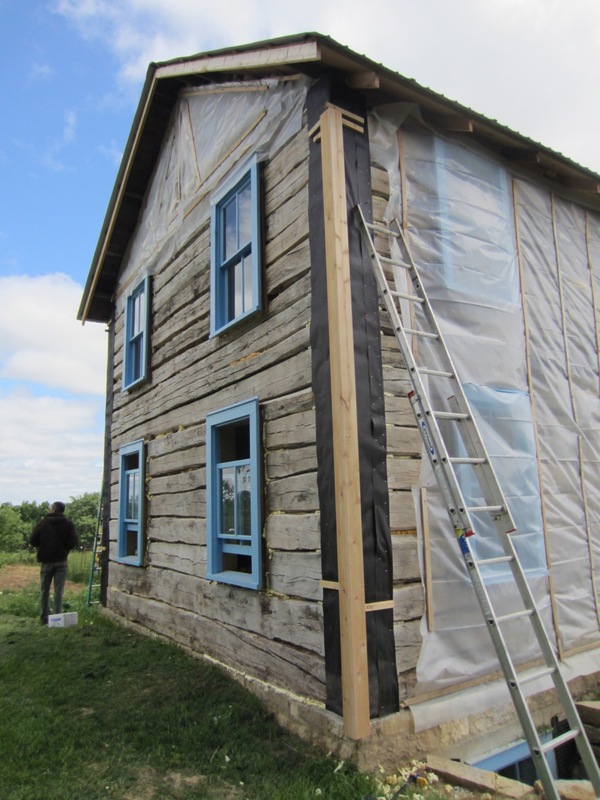 Since log walls are highly irregular and won’t allow siding to be applied directly to them, a flat plane to apply siding needs to be created. 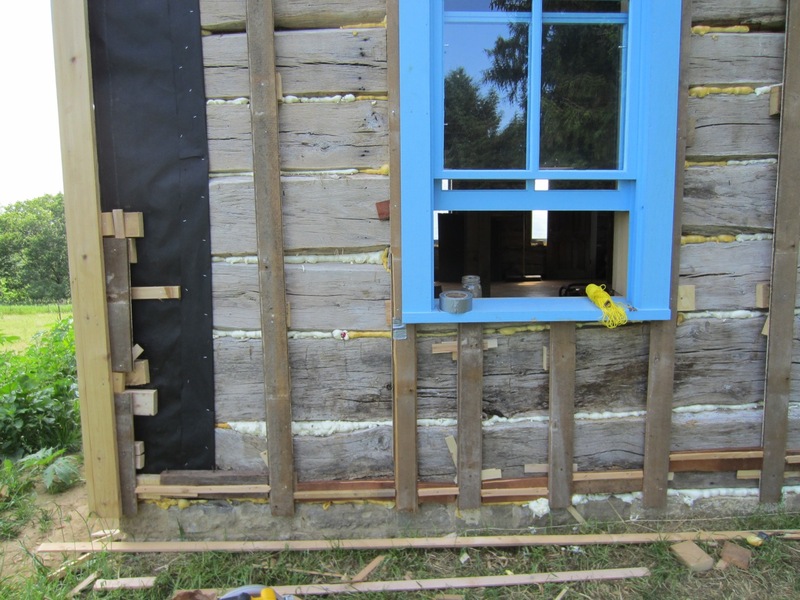 The first step in this process is making sure door and window openings stick out past the farthest outward point on the log wall. This particular building’s walls are about 6″ thick, but the window frames are 9″ deep, meaning they hang out past the wall surface by about three inches. This allows the ability to shim backward from those door and window openings with vertical nailer strips. One needs to make sure the openings all fall on the same plane with one another. For example, if there are two windows and a door on one side of a building, they all need to hang off the wall same amount and line up with each other on a straight line. Make sense? 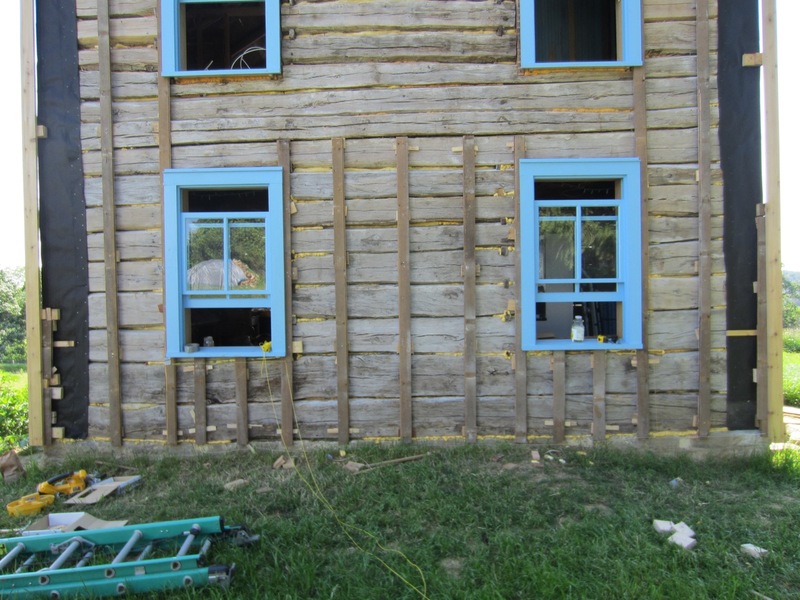 Install windows and doors, making sure they stick out past the furthest outward point on the log wall. In this case, the windows hang approximately 3″ past. If there is more than one window per side, make sure they line up with one another in a straight line. 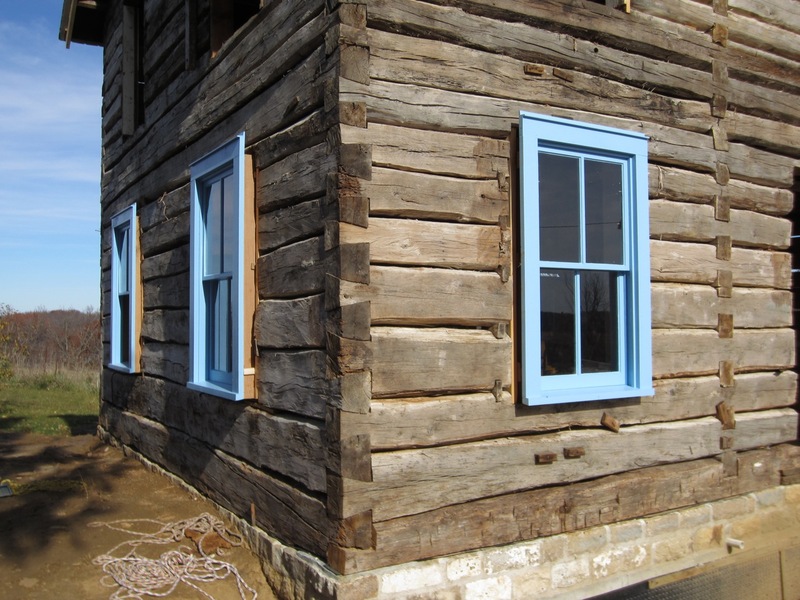 The windows are secured with casement nails nailed into vertical bucks. Once the windows and doors are installed, the corners need to be established. This is a bit confusing, so I’ll do my best to explain it. I string two lines across each side of the building, one near the bottom of the wall and one near the top. Using pieces of wood tacked to the opposing two walls on each side of the one you’re trying to calculate, fasten the string to the wood pieces at the point in which the string brushes against the window openings. Do the same on all four walls walls on both the top and the bottom. String across all sides of the building to the point at which the string brushes against the door and window openings. These are the corner points. 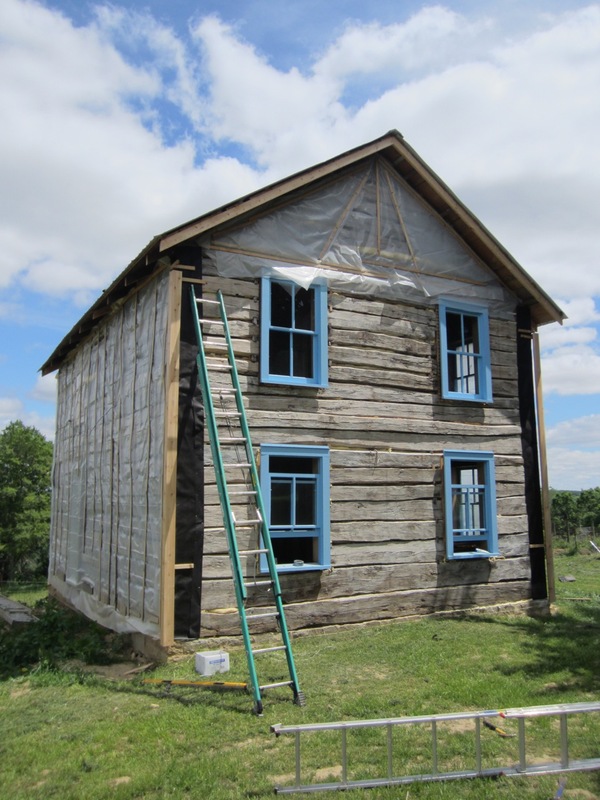 In the case of this particular project using clapboard siding, those points need to be taken back the depth of the corner boards (1″), so the outside faces of the corner boards match up with the outside faces of the door and window trim. Two pieces at both the top and the bottom mark the position of the corners. With windows installed and corners established, install the corner boards. The corners on this building are 4 1/2″ wide and 1″ deep and of red cedar. Since the boards get butted together at 90 degrees, one board needs to be 4 1/2″ wide and the other 3 1/2″ wide. Nail them together on the ground and tack them onto the corner pieces created in the previous step. The corners need to be level with one another so the siding doesn’t go up crooked. For this, install one corner and string from it across the wall to the other to determine the height of the next corner. 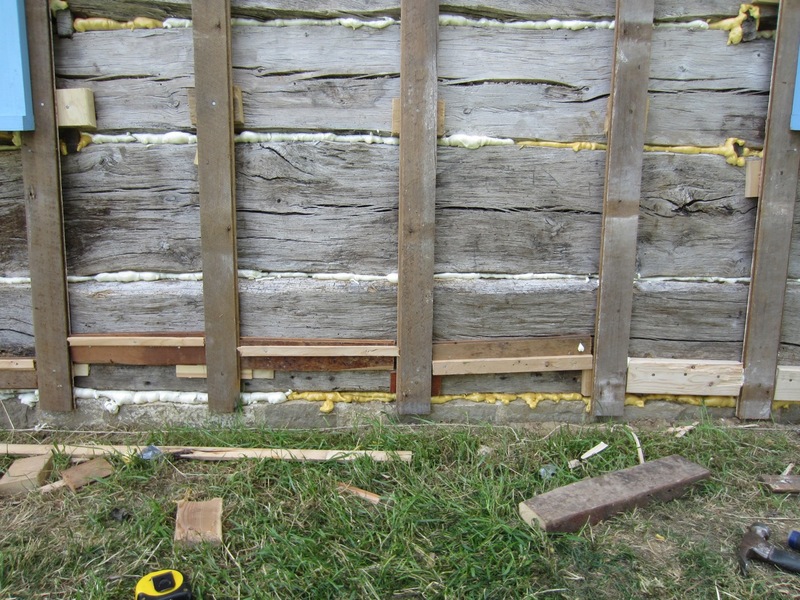 With one corner installed, string across from its bottom to the opposite corner to determine the vertical placement for the other corner board. The next step is installing the vertical nailer strips. I like to use old scrap material for this purpose, usually anything about an inch thick works. Old tongue and groove flooring, bead board or whatever… Using the string line you set up for the previous step for making sure each corner was level, tack on the vertical strips every 16″ or so. Use a 16d nail and tack each nailer strip at some point high up the wall. Leave the strips loose as they’ll be shimmed in the next step. Nailer strips tacked to the wall surfaces every 16″ or so. Make sure the bottom of each is in a plane with the bottom of the two corner pieces. 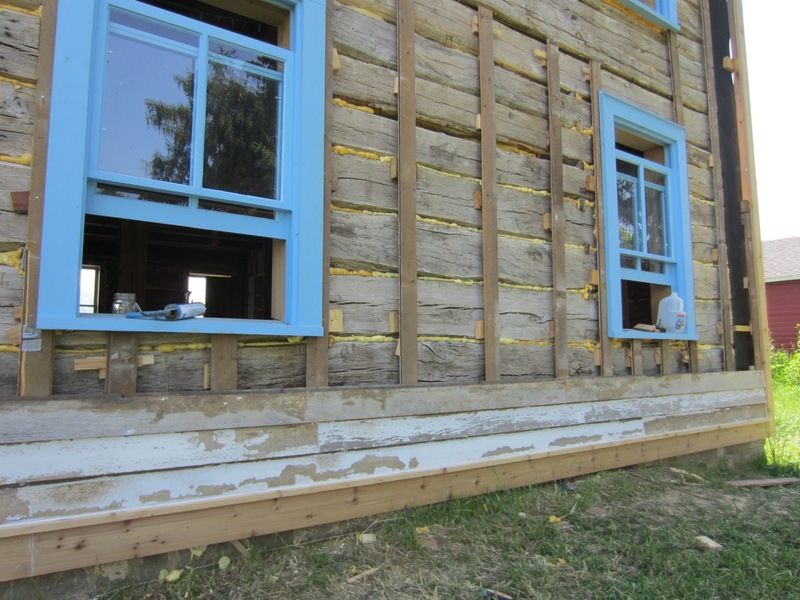 Next, using scrap material for shimming, tack on nailer strips behind the trim pieces of the windows, doors, and corner boards, making sure those strips are tight up against the back sides of the trim. Nailer strips are applied behind the trim of doors, windows and corners. It doesn’t have to look pretty, but just a surface to nail the siding to. I also like to fill in the bottoms between nailer strips so rodents and insects can’t enter the area behind the wall. Again, it ain’t pretty, just functional. Now the not so fun part. Using string tacked to the nailer strips running from opening/corner to opening/corner, determine the flat plane surface across the entire wall and shim each nailer strip accordingly. Shim behind every other log all the way up the wall surface. Attach string mounted to each corner/opening to each corner/opening running the length the wall, and shim behind each nailer strip. Shim the nailer strips to every other log running the height of the wall. You’ll need a lot of string, scrap shimming material, and patience. Whether to install a horizontal trim piece and water table at the bottom of the wall, or to start the siding right away, is up to you. Since this building originally had one, I opted to do it. This can be done in a variety of ways, but make sure the trim and water table can shed water properly. In this case, I cut the edges of the 1″x6″ trim at a 10 degree angle (creating a trapezoid shaped profile) and attached a similarly cut water table piece atop it. The water table sits at 10 degrees off flat, as does the bottom of the 1″x6″ trim piece below it, allowing water to run off the wall completely. Whether you decide to flash behind the water table is up to you. Since it’s sloped downward and out, I opted not to. Bad idea? Horizontal trim piece with water table, offset at 10 degrees to ensure water runs off the wall surface. The bottom of the trim piece is also flashed so water doesn’t pool. Should the water table be flashed? Now, the fun part. After a week of tedious work to get to this point, we’re ready for siding. 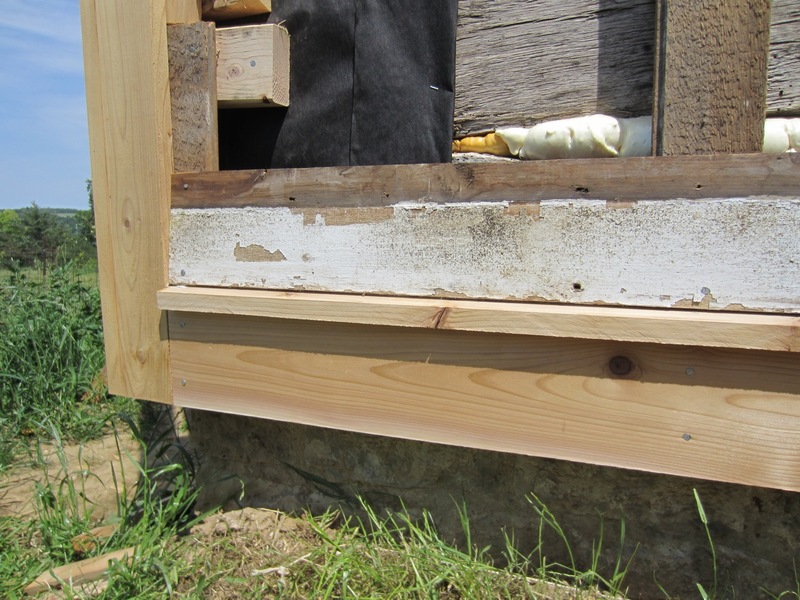 I use salvaged clapboard siding installed with an exposure of 4 1/2″. You could buy new red cedar clapboard, but at like a dollar a running foot there’s no way in hell I could afford it. Make sure to wear a respirator or at minimum a N95 mask when scraping old paint from siding. I use a 3M full faced respirator with P100 filter. First course of siding installed. Caulk below bottom siding and top of water table. 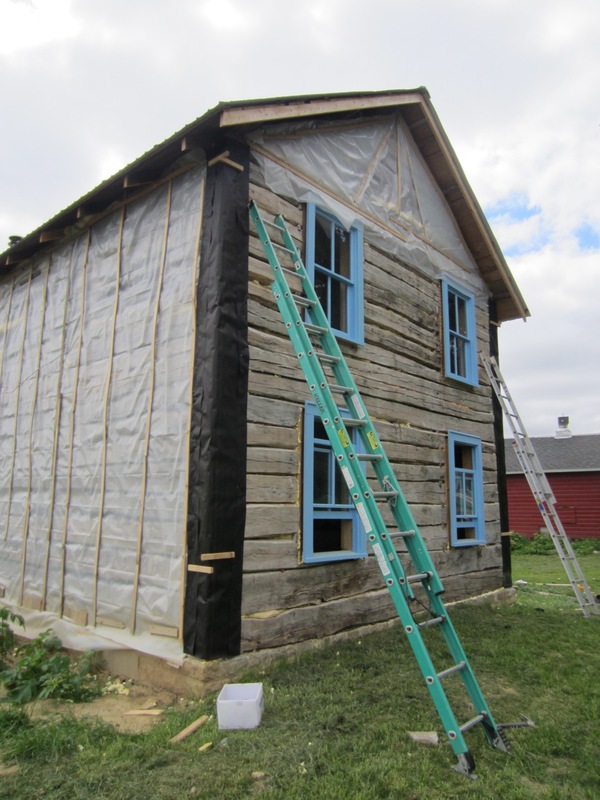 Scrape siding, caulk old nail holes, caulk the corner board/siding junctions, and paint with an oil primer. 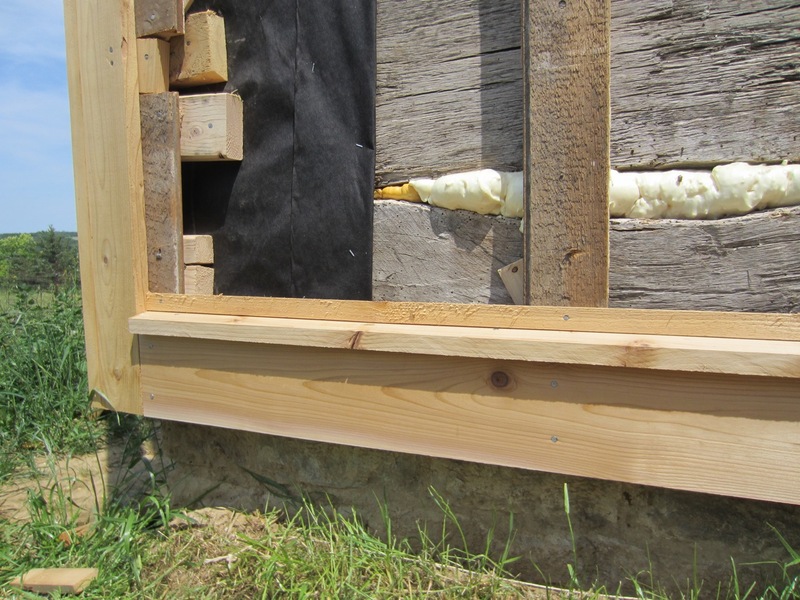 Once installed, caulk the old nail holes, the areas where the siding meets the corner boards, and around the doors and windows. Prime with oil paint and finish with a high quality latex. Looks nice, eh? This entry was posted in Uncategorized on June 12, 2012 by Paul Cutting. Hi, I simply MUST have the name of the blue paint on the windows. I absolutely love it. So very beautiful. I’ve never seen anything like this. The photographs are wonderful.